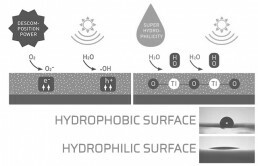 H&C Tiles is an application for Porcelain & Ceramic tiles using Hydrotect® technology, in which the titanium dioxide coating reduces pollution (NOx) and provides ceramics with self-cleaning, antibacterial and odour removal properties. H&C Tiles can be used both indoors and outdoors on Walls, Floors & Facades and boast many major benefits. The tile coating ensures easy cleaning, minimizes maintenance, eliminates bacteria and significantly reduces unpleasant odours. Ideal for health centres, production centres, swimming pools, wellness centres and spas, sports and recreational centres, industrial kitchens, catering centres, food preparation centres, public baths, changing rooms, private use, bathrooms & kitchens. There are exacting standards for hospital flooring in terms of health and hygiene, which is why the hospital sector typical uses flooring that doesn’t require joints, thus limiting the presence of bacteria. Thanks to their powerful antibacterial properties and large format, our H&C tiles can provide a solution that permanently eliminates bacterial colonies and keeps joints to a minimum (less than 1% of the surface area), while making the most of the aesthetic and functional benefits of a Porcelain Tile. 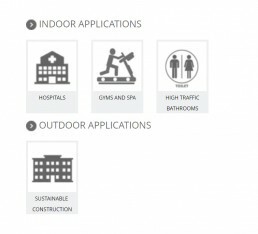 H&C Tiles reduce air pollution from nitric oxides, surfaces stay clean for longer and they provide improved sustainability for any innovative project. H&C Tiles provide major environmental benefits when used as a Façade for buildings. We can create genuine purification points that decontaminate the air by means of a chemical reaction occurring on the tile surface. The process used by H&C Tiles on outdoor surfaces does not require any form of connection, mechanism, or energy for the chemical reaction on its surface to take place, other than natural sunlight, thus, noticeably improving air quality and keeping surfaces clean for longer. H&C Tiles are a sustainable solution that helps to protect the environment and is fully compliant with even the most stringent regulations that guarantee the sustainable future of our planet.